The idea that a “trace” acquired in past experience somehow “represents” that experience, or carries information about it, is at the heart of “representative” or “indirect” realism in the philosophy of memory…. In contrast to the representative realist, direct realists and others hostile to the memory trace claim that in the act of remembering I am in direct contact with past events (2004; see also 1998, p. 280). Another philosopher who give expression to the worry that direct realism about memory is incompatible with the causal theory of memory is William Earle. Given direct realism, Earle claims, “[t]he relation between the conscious subject and its object is that of presence and not physical influence, touching, or any mode of causation whatsoever…. [T]hat past event … stands in my presence, and presence is not a physical relation” (1956, p. 26). Since the causal theory of memory is highly intuitive, if it turns out to be incompatible with direct realism, this would speak against direct realism. 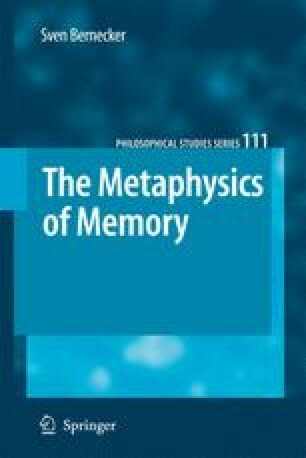 The goal of this chapter is to show that, contrary to what Sutton, Earle and others think, the causal theory of memory is perfectly compatible with direct realism. In addition, I dispel other objections to direct realism about memory. In chapter 6 I will continue to defend direct realism by criticizing the conception of a memory marker which is a central component of the representative theory of memory.